For the first helping of Corporate Insights in 2017, we’ve spoken with Rackspace to hear how, and why, the company’s “fanatical support” office design fits into the operation. 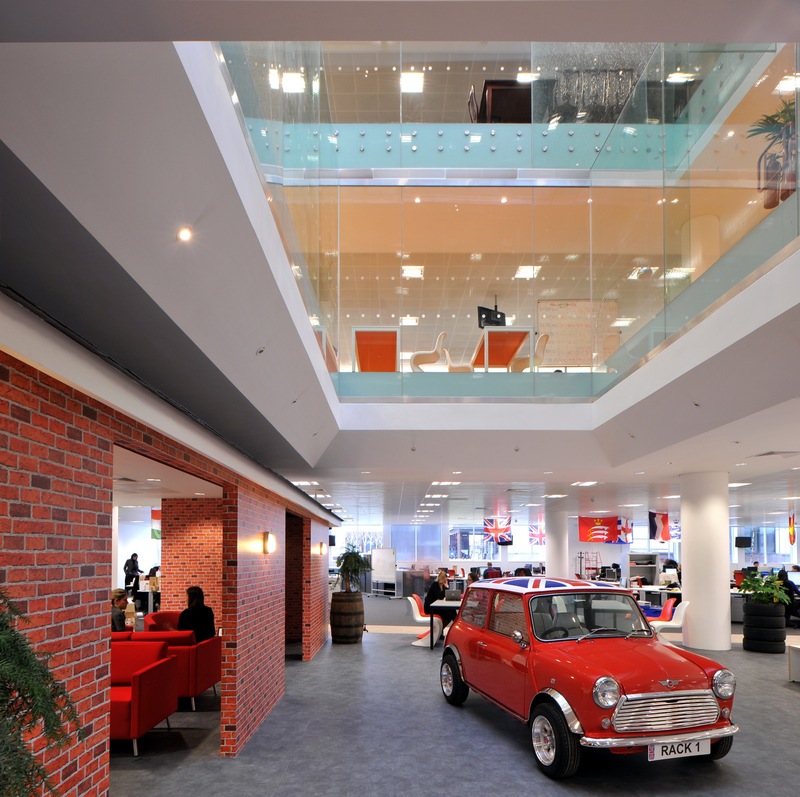 For the past few years, the idea of unique office design, perks of the job, culture and so forth have become commonplace, as employees want more from their working day, and Rackspace has recognised that fact. Offering Real Business some Corporate Insights that SME leaders can adopt for their own growing companies, Rackspace senior director of global talent development, James Mitchell, shed light on a niche term for the firm’s approach to office design. “At Rackspace we’re all about providing the best customer service and expertise for our customers, what we call ‘Fanatical Support’,” Mitchell explained. This plan translated into a multi-layered workplace that comes complete with garage-esque ground floor with Mini Cooper, a retro lounge vibe on floor one, a library atmosphere on floor two – presumably for accounts – and a back garden setting on floor three, which boasts benches, swings and artificial grass. He continued: “The focus of our office is to promote our company culture, reflecting our staff and our customers. By creating a fun, quirky workplace, with added perks like mini golf and a games room – complete with pool table, games consoles, air hockey and table tennis. Mitchell noted it was important to avoid the traditional grey corporate image, but insisted customers receive the utmost professionalism all the same. The reason for creating a visually pleasing setting in the workplace was in recognition of the fact employees spend most of their time at the office. “Creating an effective office space is vital to entice staff, retain them, and provide them with the tools and space they need to do their jobs successfully,” he said. He added that the technology sector is particularly competitive when it comes to hiring and retaining staff, so office design is especially important. For Mitchell, there are two office design elements that stand out at Rackspace’s new building – the Atrium meeting space and Client Hub. “The Atrium was designed to try and utilise an otherwise unusable area. We needed a large presentation space that would allow people to view large screens from the upper floors and the Atrium worked perfectly. It has a really eye-catching design,” he detailed. Meanwhile, the Client Hub was built as a result of listening specifically to the desires of customers. Mitchell added: “As we are not located in central London, customers would often visit the office and once their meetings were finished, found they wanted to be able to stay and work in peace – and get a cup of coffee or some food. That may seem straightforward for Rackspace, with its 6,000 employees across four continents, but how can an SME develop such an office design, you might wonder. Again, Mitchell said that listening to feedback is still key, regardless of whether the company has the office design budget of Rackspace. “Talk to your staff, ask them what they need to be successful in their jobs. Create different work zones for different purposes, perhaps swap some workstations for some soft furnishings, it doesn’t need to be expensive,” he said. In terms of managing expenses, he recommended that SMEs set a budget and from there a good designer will work to that. He added that office design needn’t be expensive to look and feel special. “As long as they reflect your culture as a company and meet your needs as a business, that’s the main thing,” he reasoned. He also offered caution to anyone considering cheap materials to lower costs. “This is often a false economy as they often don’t have the longevity of the medium or higher grade products. It is important to think this through and plan ahead – making changes incrementally can also be a big help to keeping costs down,” said Mitchell. As for whether there’s a risk of keeping things in line with a traditional office design, that’s not necessarily the case – but it’s important to stay aware of opportunities. Mitchell explained: “I can’t ever recall seeing a slide like our one at Rackspace in a financial institution, and that most probably wouldn’t work for them anyway! But if quirky touches like slides wouldn’t suit your business, and being more generic goes with your industry then then you should do it.